BATON ROUGE, La. 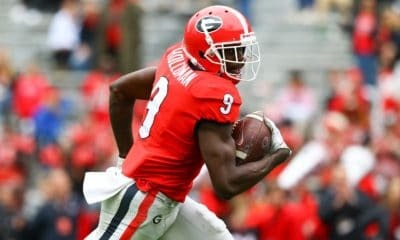 – The second-ranked Georgia Bulldogs faltered in Death Valley, suffering a 36-16 upset loss to No. 12 LSU in front of a crowd of 102,321 at Tiger Stadium. Georgia forced a three-and-out on the game’s opening drive, but the momentum didn’t matriculate to the rest of the half or game. Despite the Bulldogs (6-1, 4-1 SEC) pulling the game within 10 points at the end of the third quarter, the Tigers (6-1, 3-1 SEC) did not relinquish control as they sealed the game with 17 fourth quarter points. It marks Georgia’s first 20-point loss since losing at Auburn last season, 40-17. Defensively, Georgia gave up a season-high 475 total yards and 36 points, however the Bulldogs forced five LSU field goals inside the Georgia 25-yard line and were on the field for a season-high 33 minutes and 41 seconds. Freshman cornerback Tyson Campbell had a team-high and career-high 11 tackles, while senior defensive end Jonathan Ledbetter tallied 10 tackles – also a career high. Sophomore quarterback Jake Fromm went 16-of-34 for 209 passing yards with one touchdown and two interceptions. Riley Ridley led the receiving group with three catches for 75 yards and a touchdown, which came late in the fourth quarter. 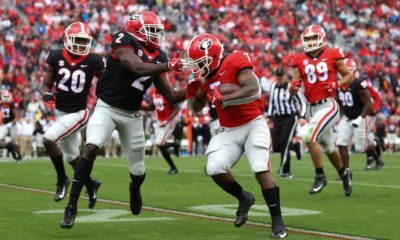 On the ground, D’Andre Swift picked up a team-high 72 yards on a dozen attempts, while Elijah Holyfield added 56 yards on seven carries and touchdown. Georgia trailed 16-0 at the half, putting the Bulldogs in the hole that they didn’t overcome. 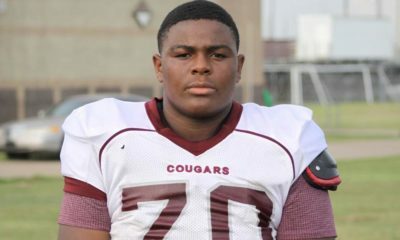 The Bulldogs’ most successful first half drive came on its second possession, which spanned 12 plays for 59 yards – all on the ground – however a failed fake field goal attempt halted the Bulldogs. At the half, Fromm was 5 for 16 for just 47 passing yards, while most of the production occurred on the ground with Swift tallying 47 yards on seven carries and Holyfield mustering 33 yards on five attempts. The Bulldogs took the opening possession of the third quarter 52 yards on 12 plays, setting up a 40-yard Rodrigo Blankenship field goal to make it 16-3. 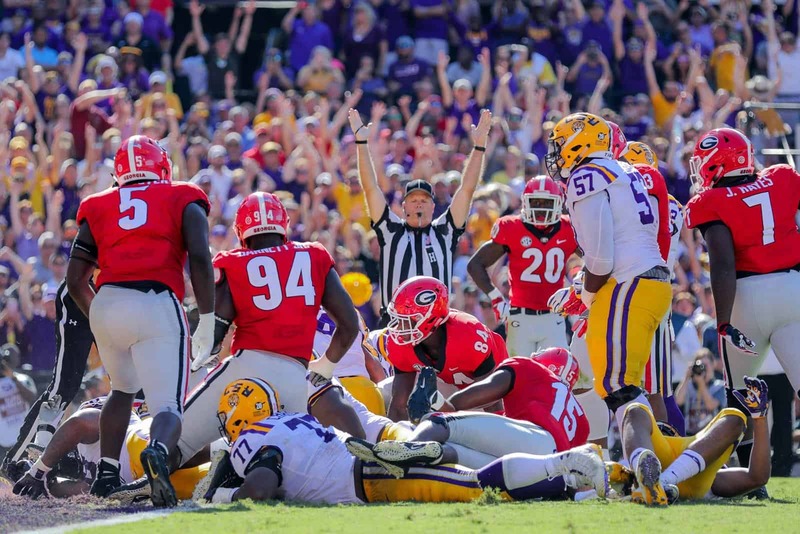 After a Fromm interception that gave the Tigers a short field, the Bulldogs defense held LSU to its fourth field goal inside Georgia’s 25-yard line. Holyfield finished off a seven-play 75-yard drive on the ensuing possession with a 10-yard touchdown run to make it a 19-9 game with the failed two-point try. Two plays earlier on a 3rd-and-6, a scrambling Fromm found Swift for an eight-yard pickup. Holyfield followed that up with a 13-yard run that was aided by a pushing offensive line, which set up the touchdown on the next play. After each team traded punts to start the fourth quarter, LSU capitalized with a touchdown to move ahead 26-9. The Tigers tacked on another field goal off a Georgia special teams turnover, which put LSU well ahead and able to control the clock until the final whistle. With today’s 36-16 loss to #12 LSU, the Tigers take a 17-13-1 edge in the series history that dates back to 1928. This was the 11thmeeting where both teams were ranked in the top 25 and LSU now leads that 6-5. Georgia has its open date next weekend before traveling to the annual neutral site game against the Florida Gators in Jacksonville, Florida on Oct. 27 at 3:30 p.m.
*Series History: With today’s 36-16 loss to #12 LSU, the Tigers take a 17-13-1 edge in the series history that dates back to 1928. This was the 11thmeeting where both teams were ranked in the top 25 and LSU now leads that 6-5. *Points off Turnovers: The Bulldogs came in today+6 in Turnover Margin with only three turnovers on the year that resulted in no points by the opponents. LSU forced four turnovers and turned them into 13 points. *No Points At The Half: For the first time since the 2016 Auburn game on Nov. 12, Georgia was shut out in the first half. Auburn led 7-0 at the half that day, and the Bulldogs rallied back for a 13-7 victory. The Bulldogs came in today averaging 42.8 points a game, and at the half, the Bulldogs trailed LSU 16-0 and ended with their first loss of the year. *A Look At The Defense: In the first half, LSU built a 16-0 lead. The Tigers ran 45 plays for 246 yards. After forcing LSU to punt on its first drive, the Tigers scored on their next four possessions, getting one TD and three field goals. For the game, the Tigers tallied 475 yards on 81 plays with three touchdowns and five field goals. Georgia’s leading tacklers with career-highs were freshman DB Tyson Campbellwith 11 and senior DE Jonathan Ledbetterhad 10. The Bulldogs had three sacks in the first half as D’Andre Walkergot his team-leading fifth while Tyler Clarkand Keyon Richardsonsplit a sack and freshman OLB Robert Beal, Jr.,registered his first. A Look At Fromm And The Offense: Sophomore QB Jake Fromm came in ranked fourth nationally in passing efficiency but struggled going 5-for-16 for 47 yards in the first half and finished 16-for-34 for 209 yards with 1 TD and 2 INTs. In the opening possession of the second half, Fromm went 4-for-5 for 45 yards as the Bulldogs managed a field goal. However, the second possession ended with an interception at the UGA 23, and the Tigers turned into a field goal and a 19-3 lead. Georgia answered with its first TD-drive of the contest, going 75 yards on seven plays capped by a 10-yard run by Elijah Holyfield. A two-point try failed so the Bulldogs only cut the deficit to 19-9. Junior Riley Ridley (3 rec., 75 yards, 1 TD) caught a 27-yard TD pass to cut the deficit to 29-16 with six minutes left in the contest. 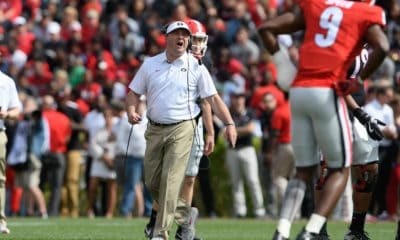 In the first half, Georgia’s offense was limited to 32 plays for 124 yards and no points and for the game finished with 16 points on 64 plays with 322 yards. *Another Early Deficit: For the second straight contest, Georgia fell behind after never trailing in the first five games of the year. Today, LSU capped a nine-play, 65-yard drive with a field goal with 9:32 left in the first quarter for a 3-0 edge and led the whole game. Last week, Vanderbilt went up 3-0 in the first quarter and Georgia responded with a one play, 75-yard TD and led the rest of the way. The deficit against the Commodores lasted 15 seconds. Today on its second drive, Georgia drove to the LSU 14 and then attempted a fake field goal. Junior PK Rodrigo Blankenship was stopped for a loss of two yards and fumbled on the play. LSU took over at the Georgia 16 and went 84 yards for a TD and a 10-0 advantage. It was the longest TD drive against Georgia this season. Georgia trailed 13-0 with 11:22 left in the first half after a 36-yard field goal capped a 5-play, 53-yard drive. LSU extended its lead to 16-0 with 5:09 remaining after a 39-yard field goal. The last time Georgia attempted a fake field goal was 2014, and it was successful against Georgia Tech, a 28-yard rush by PK Marshall Morgan. *Running Game: The Bulldogs finished with 113 yards on 39 carries. In the first half,Georgia’s rushing attack tallied 77 yards on 16 carries. For the game, sophomore D’Andre Swifttallied 72 yards on 12 carries while junior Elijah Holyfieldhad 56 yards on seven carries. * Blankenship Provides 1stPoints: JuniorPK Rodrigo Blankenship went 1-for-1 on field goals. He made a 40-yarder to put Georgia on the board on its first drive of the second half as the Bulldogs then trailed 16-3. He is 10-for-12 in field goals this year including 6-for-7 from a range of 40-49 yards. He had four kickoffs with three touchbacks and squibbed his final one as the Bulldogs looked to rally. Also, he was part of an unsuccessful fake field goal attempt. *For Starters On The Line: Senior center Lamont Gaillard started his team-leading 35thstraight game while junior DB J.R. Reedleads the defense as he’s made 22ndconsecutive starts. Junior Charlie Woernermade his first start of the year and fourth of his career as the Bulldogs opened with a two tight end set. *Captains: Today’s captains were seniorsNatrez Patrick (ILB), Terry Godwin (WR) and D’Andre Walker (OLB). *Up Next:Georgia (6-1, 4-1 SEC) is off next Saturday and returns to action versus No. 14 Florida (6-1, 4-1 SEC) in Jacksonville on Oct. 27. Kickoff will be at 3:30 and televised by CBS-Sports.